What a great week we had last week! It was pretty much a week long celebration for my birthday ending with a fabulous family trip to the Sierra's. We go every year and it's something the whole family looks forward to. This year was one of the best years in terms of weather and snow which makes it even more enjoyable. I'm a lucky lady. This week it's back to the grind with days chalk full of commitments. Someone send me back to play in the snow! . . .
John and the boys are working together to bake me a cake for my birthday tomorrow. It turned out perfect and was oh so yummy! I celebrated my 43rd birthday today with my sweet family. Tuesdays are long, busy days, but I took the day off from work, had lunch out with John, and then waited for the boys to return from karate so we could dig into that wonderful cake they made. Time to bring out the ski gear and start packing for our trip to the mountains. The covered pool table is the perfect sorting place to get it all pulled together. We made it to the condo at Northstar near Truckee in the Tahoe area. We hit the road right after the kids got out of school, made nachos and fresh baked cookies for dinner, and then snuggled in for the night. We'll have an early start tomorrow so we can hit the slopes first thing. These beds have the most amazing fleece sheets that are so cozy and warm so hopefully everyone will sleep well. There's my little guy! At least he's resilient and feeling much better today. We slept in, made a nice pancake breakfast, packed up, and then hit the mountain for some snow tubing before heading home. I took this picture while we were all held together sliding down the hill and love that smile showing the thrill of the ride for Brandon. OK, maybe 2 more ;0) I had to include both because I couldn't decide which I liked better. Of course these were taken on the last day of our ski trip while the family had fun snow tubing together. It was a great way to end our weekend. So now who's sending me back to the snow? Never mind--I must work to help pay for the next trip which means we are done here! Thanks for stopping by and hopefully I'll see you next week. Happy Birthday to me! Today is my birthday, and I even took the day off from work so I could have a day to myself--what a concept! I should do this more often ;0) It was yet another busy week that quickly came and went. At least we had a nice long weekend and of course our highlight was the 49ers making it to the Super Bowl. It's been a long time since we've seen them there. I grew up in their glory days but that was a long time ago so it's wonderful to finally see them back on top. 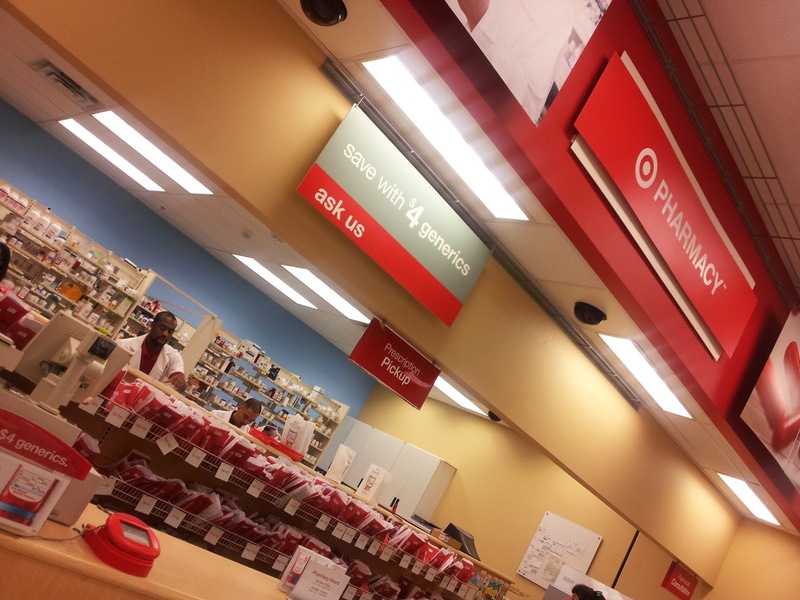 A new year means new meds. The people here at the Target pharmacy know me well. We saw Brandon's neurologist today. We see him every 6 months and the year prior he had a really good year with only 3 migraines that resulted in vomiting attacks, but the past 6 months have not been so great. He's had at least 8-10 episodes (so many I've lost count) and even the timing has changed so now its effecting school as well. It must be time to try something different. We're switching his daily meds to a beta-blocker in hopes that will help more. I just picked the younger boys up from school and as usual they are raiding my pantry before starting homework. It's getting harder and harder to keep this thing stocked. Just wait until the oldest gets home and then it's game over. These two are lucky they get a head start. Rusty and Bella like to taunt each other. Our afternoons can be pretty crazy with the two of them chasing each other around. It's all fun and games though, and when they get tired they'll settle down and snuggle together. Tyler is studying for his finals. He had English and Biology today and Spanish and PE tomorrow. Next week he starts all new classes--Geometry, Engineering, Biomedical Sciences and more PE. I know he's ready for the change. Justin's friend Adrian came by for one last sleepover. He's moving across the country to Pennsylvania next week! This is the last time they will probably see each other which is really sad. Look how sunny and warm it is too. It's staying light later which is nice and even though our mornings are still frosty the afternoons feel nice. The Wongs took John and I out to dinner at Bandera for my upcoming birthday, and then we went back to our house for more drinks. Sharon gave me some pretty crystal earrings in this cute little Paris box. Love it! The SF 49ers win and go to the Super Bowl! We watched the game at Sharon and Richie's. It was a close game and tense at moments with our team coming from behind in the final quarter. After they pulled out a win the guys could all relax and celebrate their team's victory. This next week won't end soon enough. We're heading to the mountains to play in the snow and ski for my annual birthday trip and of course everyone is super excited. Thanks for stopping by and hope to see you next Tuesday. I'm missing the holidays and my time off. It's nothing but crazy schedules here now and cold temps that make it hard to get up in the morning and leave the house. At least getting back into a routine is good. It most certainly helps with the toning which in turn helps with the stress so that's a win-win ;0) I just need more hours in my day or more days off without kids home--yeah, that would help too. Brrr! Baby, it's cold outside!! We woke up to freezing temps pretty much all week, and it didn't really warm up during the day either. The sun was shining, but it was still REALLY cold out. We all had to make sure to bundle up. Not only is it freezing outside, but my lab work space is also very cold. It's hard to type when your fingers turn blue so I'm loving these new fingerless gloves Brandon gave me for Christmas. They really do help. It's a late-night pizza bagel for Tyler's dinner. I try to get him to eat before water polo practice but just couldn't make it happen today with other appointments going on so here he is at 8:30 pm after 3 hrs of practice scarfing down whatever I could make the quickest. This is my last kid to teach times tables to. We practice most nights before bed. He's got it down up to the 6's and is now working on 7's, 8's and 9's which are the hardest to learn. He's almost there, and then we need to work on speed. Just before the end of winter break Bella was chasing a ball in the house and turned too fast banging her head into the pool table. I saw and heard it happen. It really knocked her for a loop. At the time I didn't realize she actually split the skin open just above her left brow. It was hard to see the dark scab against her black fur, but now that it's healed and fallen away she has a very noticeable scar. Poor puppy! We're not sure if the fur will ever grow back in. Game day! John and the boys had fun watching the 49ers beat the Packers in the playoff game this afternoon. They even dressed the part with the new jerseys they got for Christmas. Go Niners! Brandon built the last of his Lego sets Friday after school and has been playing with it all weekend. He was so proud for completing such a huge set on his own and in record time. I'm so happy to have that first work week of the new year out of the way and ready to tackle the next. Thanks for stopping by and see you next Tuesday. Welcome to a new year! My one word for this year is "tone". I need and want to tone my mind, body and soul. I feel like those 3 things are in a good place but could use a little fine tuning to get them right where they really need to be. I also plan to catch up on a few projects like getting my past 365 pictures into digital books. I had one done for 2010 and got half way through the year for 2011 but then lost track of time and now here we are starting 2013! I'm working on getting my Europe pictures into a book as well and loaded onto a digital photo frame I got for Christmas. I know once I get it set up I'm going to love that thing, but I need my pictures totally organized first, and I'm not quite there yet. I want to put all our monthly family pictures on the frame too. We'll see--lots to do and little free time between juggling work and family. It seems like the last thing I need is more pictures, but I'm excited to start another year of project 365. It's been amazing to look back over the past 3 years and see how our family has grown. These are my wonderful boys getting bigger and older day by day. They are all ready to tackle a new year but not quite ready for school to start again next week. Brandon spent most the day building a KRE-O Transformers set. The sets are a lot like Legos but can be built in two ways--robot or vehicle. Brandon has a couple other sets like this and he likes to build the robot first to play with for a couple weeks before destroying it to rebuilding the vehicle--in this case a firetruck. 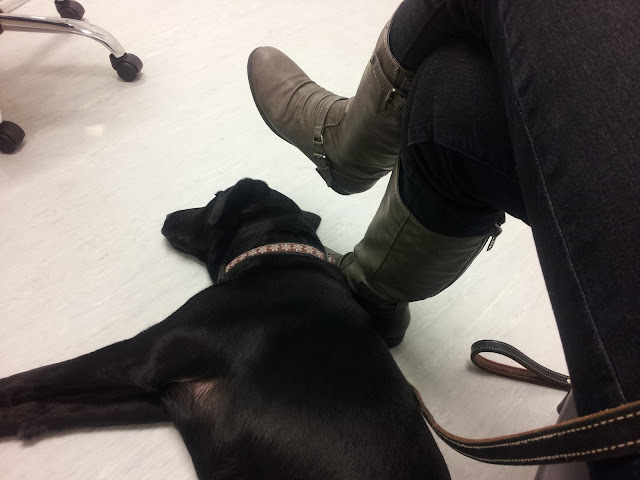 Bella and I are waiting at the vet hospital for her exam and heartworm test. It's time to renew her preventative meds. She looks all mellow here but as soon as the Dr. came in she was overly attentive trying earn good behavior treats. She has them all figured out and ended up leaving with way too many treats in her belly. It's Friday afternoon and I've got some winter sangria made waiting for the Wong family to show up and help us celebrate the start of a new year. So yummy! It turned out really good considering I used some "cooked" wine I got stuck with. Now I know exactly what to do with the other two bottles. It's Justin's turn to do some building. I love how he has to roll his sleeves up to get down to business--this is serious work here. LOL! He does not like the larger more complicated sets like his brothers but prefers the smaller Hero Factory sets that make creatures. He must have at least 30 collected and built. We're running out of room for them all! This is Rusty my laundry buddy. He loves laundry day, but I can't really say he's much help. His favorite part is running between sorted piles and ambushing people that walk by. You can see John in the background reading the Sunday paper. I'll save Monday for next week's post and go Monday-Sunday each week after. Thanks for stopping by and hope everyone had a great first week. For inspiration and support I link up at the following places--check them out! Happy New Year! It seems like each one flies by faster and faster. This will be another quick post because today we are celebrating the start of 2013, and I have family and friends to get back to, but still wanted to share our last week of 2012. 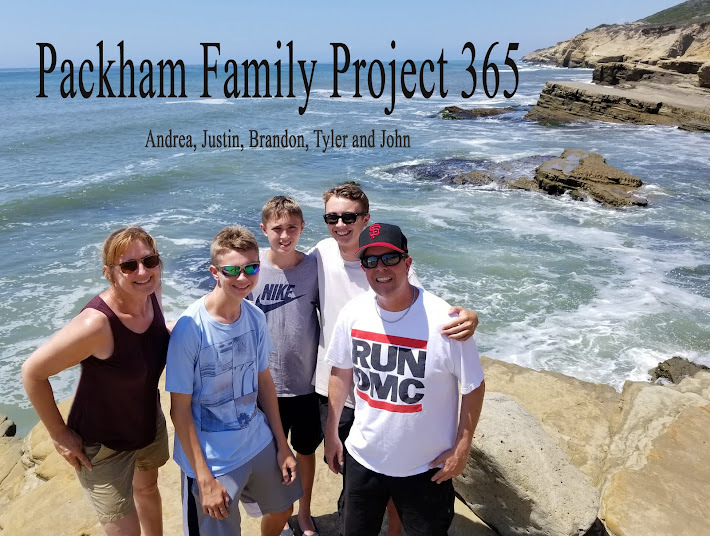 This post is short on words but includes more pictures than usual with all the remaining days of this past year, this month's family photo, and a monthly favorite for the Project 366 Rewind submission. While I baked cookies all day the kids took some time to join me in the kitchen for building and decorating a Gingerbread house. All that leftover Halloween candy came in handy. We've had some bad, stormy days this past week, but today was actually nice and clear so we headed to the mountains for some Christmas Eve fun enjoying all the fresh new snow. What a beautiful day in a winter wonderland! Merry Christmas! Looks like John was a good boy this year. The whole family made out and had a great, low-key Christmas together. Justin and Brandon are enjoying their new Wii U system. Tyler is working hard to build this huge Halo Mega Bloks set. It's a bit more challenging than Legos because they don't separate the pieces into smaller bags--lots of searching for all those little, just-right pieces! John gave me some new glass ornaments to help remember and mark our European trip this year. This is 3 of the 6 in a set and sadly this was their last day on the tree as the whole thing came down soon after the picture was taken. It's time to put Christmas away. I was also given this new sweater blanket which I love, but it looks like I'll be sharing it with a friend who also seems to be quite fond of it. Brandon is happily reading a new Geronimo Stilton book on the Kindle grandma sent him. She got a Kindle Fire for Christmas and knew he was the only one in our family without a Kindle so she mailed him her old one. We'll get him a new cover in blue this week so it feels more like his. As you can see he's also wearing a 49er jersey ready for today's big game. All 3 boys got new jerseys from their dad for Christmas. We're making New Year's Eve pizza. Usually we have homemade pizza on Christmas Eve, but we didn't have time to prepare the dough with our trip to the mountains so we decided to do it for New Year's Eve instead. It's always a fun family activity with yummy results. We make the best pizza if I do say so myself! Later we'll head to 2 different parties to ring in the New Year with friends. This was taken on Christmas Eve after we came back from the snow and before we let the kids open one gift for the night. Taken in at Sierra-at-Tahoe ski resort on Christmas Eve. I love the snow blowing and how the sun is bursting up over the mountain especially since it's been several days since we've actually seen the sun! That wraps up another year! and check back next Tuesday to see how we started off 2013.